Turn off of U.S. 93 approximately 16 miles west of Caliente and drive about 15 miles south on a gravel/rock road to the present day ghost town site of Delamar. Road not recommended for passenger cars. Visitors should be warned that the Delamar town site, like many other old mining camps, is on private ground near dangerous mine workings and access is limited. Never enter abandoned mining caves or structures. 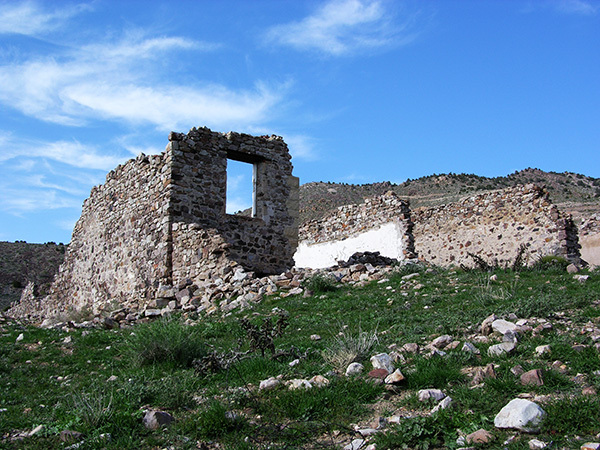 Shortly after farmers from the Pahranagat Valley discovered gold in 1890, the Ferguson Mining District was formed. Reports reached Pioche of assays ranging from $75 to $1,000 value for a ton of ore, resulting in a rush of miners to the Ferguson District. Golden City and the town of Helene were the first small temporary. Two years after a fire destroyed half of the town in 1900, Captain Delamar sold his mines which had produced an estimated $8.5 million in gold. The new owners, controlled by Simon Bamberger, continued to out-produce all other mines in the state until about 1909, at which time the operation was closed and only reopened briefly from 1929-1934. Today, partially standing rock buildings, mill ruins, a cemetery and ghosts from the past are all that remain at this site.